Campsite Verte Rive is a campsite with 22 touring pitches and 2 year round pitches. During low season, between 01-04-2019 - 28-06-2019 and 01-09-2019 - 29-09-2019, the nightly rate is €14,- at one of the 22 touring pitches at Campsite Verte Rive in Cromary (Haute-Saône). At this campsite you can not only use your CampingCard ACSI for inexpensive camping, you can also use your ACSI Club ID (as an alternative ID). Small, welcoming campsite on the banks of a river. You can rent canoes at the campsite and have a drink in the bar. A small site with large hedged pitches with the option of full, partial shade or open. Gives a cosy feeling but private. The adjacent river excellent for cooling. off and swimming with dog no problem. No problem with mosquitoes on our visit, I guess that is climate conditioned. Received a very warm welcome from the owners (dog lovers) who only took over this site April 2018 and who are working hard to please and deserve to do well..Wash and WC facilities good. Including good wifi reception throughout site. A very nice small campsite with good toilet facilities and WiFi on the pitch.Large supermarket about 6 klm away,nothing in the local villages. If you like mosquitoes, this place is for you. There were so many mosquitoes flying in your face all day and night. It was really annoying. 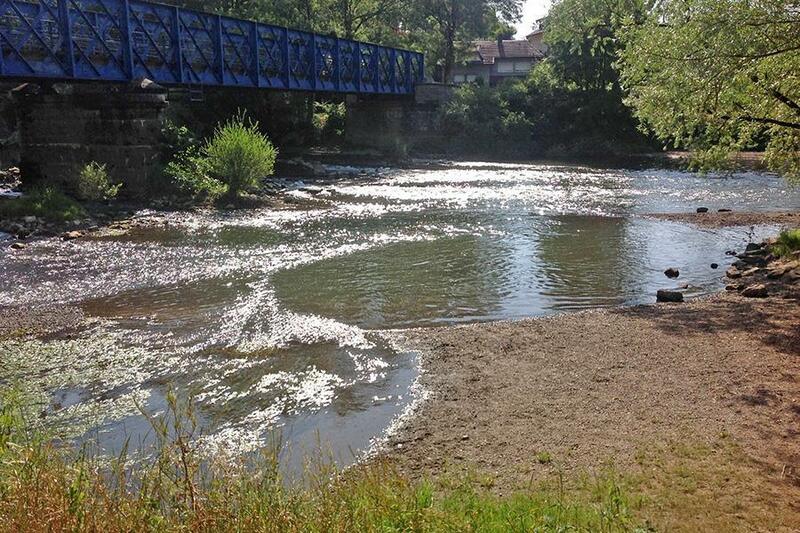 Beware of paying a fine if you let your dog off the lead to go swimming in the river. The woman running the campground is very unfriendly to dogs running free. We had the pitch right in front of the river and our dog loves to swim. The man who checked us in said it would be fine to let our 2 small dogs off the lead to swim so we were surprised to see extra charges for the dogs when we paid the bill. The horrible wifi works only at reception and is unreliable. There is nothing nearby and closest supermarket is about 8km away. Will not return due to horrible attitude of woman managing the property. If you like mosquitoes, this place is for you. Hundreds of tiny mosquitoes flying in your face all day and night. We left after 2 days with so many mosquito bites! WIFI is horrible. Beware of hidden fees for dogs. They charged us extra for our 2 small dogs because we took them off the leash to swim in the river. We have stayed in 100+ campgrounds all over EU and have never been fined for having our dogs off the leash! We had the pitch right in front of the river which was beautiful and facilities are fine BUT we will never return due to mosquitoes and unfriendly owners towards dogs. A lovely peaceful site adjacent to the river. The owners are warm and very welcoming. Although the bar and pizzeria were not yet open would be great to return as can imagine both would be great. Would you like to book Campsite Verte Rive or request more information? You can do both using the information below. Take Devecey exit on N57, then follow Bonnay, Vieilley to arrive in Cromary. 6km from Devecey to the campsite. CampingCard ACSI will send your information request to "Campsite Verte Rive".